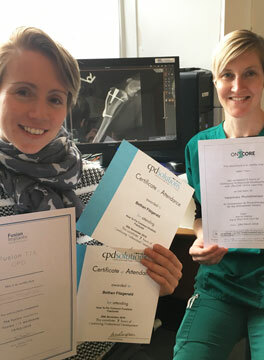 In the last few years I, Bethan Fitzgerald MRCVS, have concentrated on becoming skilled in the subject of orthopaedics, which includes fracture fixation and cruciate repair surgery, especially TTA (see X-ray). I am very happy to congratulate our RVN, Kate for achieving a credit for a veterinary physiotherapy course. Kate too has a keen interest in orthopaedics and already assists in theatre with me but now is qualified to help with patients rehabilitation before, during and after surgery. This will make a big difference to the quality of care we can offer.